Different Body Types | Are You An Ectomorph, Endomorph, or Mesomorph? Different Body Types: Are You An Ectomorph, Endomorph, or Mesomorph? 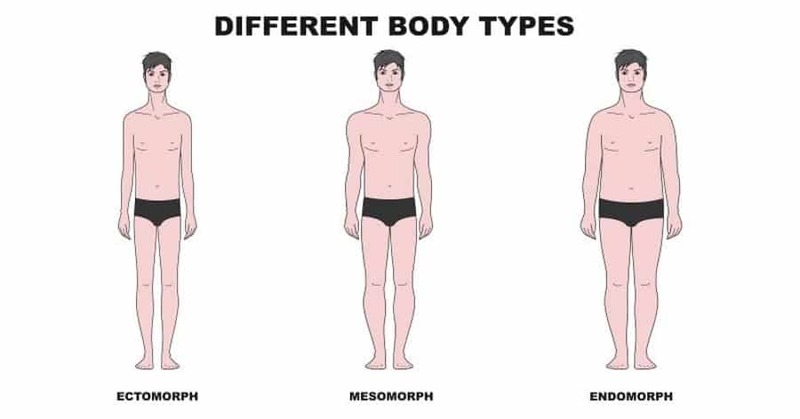 Home > Blog > Anatomy > Different Body Types: Are You An Ectomorph, Endomorph, or Mesomorph? The three different body types (also called somatotypes) include the ectomorph, endomorph, and mesomorph. On this page, you’ll learn how to determine your body type so that you can make your genetics work for you – not against you. …And so, you must take each strength and weakness into consideration when designing your bodybuilding diet and choosing the right weight lifting routine. Now, let’s get to finding out about body types, so that we can pinpoint how you can improve your weight training results. You’re in Control…Most of the Time. Although I have already discussed the myriad of weight lifting benefits, one of the major advantages of weight training is that your progress is something you always have control over. In a world with less and less control, weight lifting represents the ultimate means of self-improvement. However, while you always have control over your progress, you don’t have control over your genetics. Work With What You Have. You must be able to learn and embrace your different body type. That way, you can do everything in your power to make it the most efficient, natural machine possible. The “Hybrid” Body Type. Don’t worry if you don’t perfectly fit the profiles for one of the different body types. The majority of people will probably fall into the category of a hybrid or mixed body type, with one body type being “dominant.” Since there is so much personal variation within each of the different body types, the recommendations I give can only be so specific. But if you test them out, you’ll be sure to find something that works great for you! The Ectomorph Body Type. If you’re on the outside looking in, it may seem like the ectomorphs are blessed with the best of the three different body types. These are the people who could gobble down Maccy D’s and glazed donuts until the cows come home, without gaining an ounce of fat. Are You an Ectomorph? If you think the ectomorph body type best describes you, then check out the list below of the common ectomorph characteristics. Not all of the characteristics need apply to you, but the majority should if this is your dominant body type. “What Should I Do If I’m an Ectomorph?” Your goal is to put on quality mass and keep every ounce of muscle that you attain. However, your main challenges are finding ways to work around your blazing fast metabolism and smaller appetite. Your daily calorie maintenance level is way higher than that of the different body types. So, you will have to counteract that with a very high calorie diet (eat more calories than you burn). Embrace Flexible Dieting. Don’t stress about food choice – total calories + enough protein is most important. Implement a High-Calorie Diet Plan. Eat calorie-dense/full fat foods (e.g. peanut butter, whole milk, whole eggs, or even some fast food). Some ectomorphs may require 4000-5000+ calories to gain weight, so these types of food make that a whole lot more practical. Take a Weight Gainer. Try a weight gainer supplement that’s packed with calories. Similar to eating calorie dense foods, a weight gainer supplement makes it easier to physically fit your daily calorie requirements into your stomach. Limit Cardio. Limit cardio and excess physical activity. This decreases the number of calories you burn per day, which makes it that much easier to be in a caloric surplus. If you can’t or don’t want to do this, you’ll have to eat more food to make up for the calories you expend. Do Short Workouts. Keep your weight lifting routine time to a minimum. This also reduces the number of calories burnt per day, while still stimulating muscle growth. Get More Sleep. Ectomorphs tend to get less sleep than others. Try sleeping more so you can recover better as well as burn fewer calories. If you have trouble sleeping, supplementing with the right melatonin dosage can help you sleep more productively and get you on a consistent sleeping schedule. Endomorph Body Type. The endomorphs get the raw end of the deal compared to the two other different body types. This body type can be classified as naturally heavy and round. People with this body type have a naturally slow metabolism that makes it easier to gain weight, but hard to lose fat. If they gain weight quickly, the majority of it will be fat, not muscle. Are You an Endomorph? If you think the endomorph body type best describes you, then check out the list below of the common endomorph characteristics. Not all of the characteristics need apply to you, but the majority should if this is your dominant body type. “What Should I Do If I’m an Endomorph?” Your goal is to start by shedding fat and adopting a lifestyle that keeps the “fat boy” problem under control. Next, you want to transition into gaining muscle, while making it a priority to minimize fat gains. The major difficulty is that your maintenance level of calories is very low, compared to the two other different body types. So, you will have to counteract this with a low calorie diet when losing fat (eat fewer calories than you burn) and a slightly higher, but still low calorie diet when gaining muscle (eat more calories than you burn). Implement a Low-Calorie Diet. I do believe that flexible dieting is best. However, endomorphs have the least amount of flexibility in terms of food choice because they can only consume a limited number of calories per day. So, the best bet is to stick to a majority of “clean” foods that tend to be lower in total calories and saturated fats. But do treat yourself to your favorite foods when you can fit it into your diet plan. Carbs or Fats? Find out what makes you less hungry: carbs or fats. It varies on the individual, but many endomorphs become hungrier and bloated after eating carbohydrates. Whereas, they feel more full and satisfied after eating meals with fat. If this describes you, then eat more fats while limiting carbs. More or Less Protein? Consider eating closer to 1.5 g/lb of bodyweight (or per pound of lean body mass if you have a lot of body fat). Protein suppresses appetite and burns more calories during digestion. However, you should eat closer to 1.0 g/lb if you would feel more satisfied by eating more carbs/fats instead of the extra protein. Remember Hydration. All of the different body types should stay hydrated, but it’s especially important for endomorphs. It can help cut down on short-term food cravings as well as aid in weight loss. Cardio. Do cardio 2-3 times per week – I recommend moderate intensity cardio for 20-30 minutes per session. Consider HIIT cardio on one of those days if you are in good enough condition and can recover quickly enough so that it doesn’t interfere with lifting. Mesomorph Body Type. If you could choose to be any of the three different body types, this would be the best pick. The mesomorph is genetically gifted in terms of muscle building capabilities and body aesthetics. Think of the stereotypical jock or star athlete – naturally strong, muscular, and lean with broad shoulders and a narrow waist. Mesomorphs take the best qualities from endomorphs and ectomorphs, but have none of the bad qualities. They have a normal to fast metabolism, which contributes to their ability to gain lean muscle and lose fat with relative ease…lucky bastards! Are You a Mesomorph? If you think the mesomorph body type best describes you, then check out the list below of the common mesomorph characteristics. Not all of the characteristics need apply to you, but the majority should if this is your dominant body type. “What Should I Do If I’m a Mesomorph?” You have different goals than the “less fortunate,” or those with the different body types. Since you are built to excel with strength training and building muscle, you want to focus on finding what approach is optimal as well as staying dedicated. Use (Relatively) Flexible Dieting. Similar to the ectomorph, your diet can be quite flexible in regards to food choice. However, be careful not to order too many waffle fries with your chicken sandwich since your metabolism isn’t that fast. Seek to Improve. You’ll do well on almost any routine. That sounds great, but it can hamper your potential because you may be less likely to seek out better options. Try different approaches and keep what works the best. Who knows, maybe you’ll be the next Ronnie Coleman or Mariusz Pudzianowski. Don’t Waste Your Potential. There are a lot of “lazy” mesomorphs out there who don’t take their regimen as seriously as they could. If you really want to push your limits, then don’t fall into the trap of half-assing it because you still see results. Remember, the ectos and endos would kill for your genes! Cardio. Mesomorphs don’t necessarily have to do cardio since they tend to be naturally leaner. However, it can definitely be helpful, especially if you’re cutting. Try up to 3 days per week. You could probably do HIIT cardio on two of the days, but three days of HIIT might be pushing it (yes, even mesomorphs have limits). Otherwise, you can do moderate intensity cardio for 20-40 minutes per session. Everyone Can Get Big, Lean, and Strong. It’s extremely important to remember that genetics are only part of the equation. So, don’t be discouraged if you have “bad” genetics. A smart approach combined with intense persistence and dedication can turn a 98 lb. weakling into 200+ lb. behemoth. Yes, it may be frustrating at times when dealing with some of the different body types. However, the best thing you can do – in fact, the only thing you can do – is to embrace what you have been given. Use the different tips listed for the body type that best describes you. But remember that some things may work wonders, while others may do jack diddly for you. Everyone is different, so you must be willing to experiment in order to unlock your full potential.